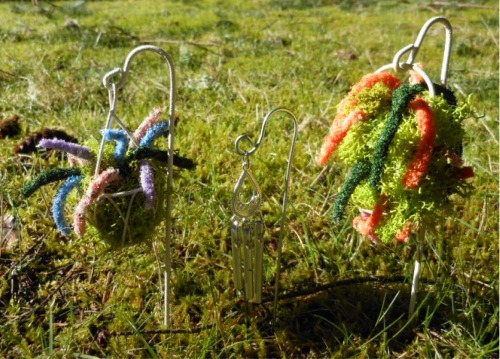 Made of twigs and moss, this working swing will help your wee garden guests to spend a lazy sunny afternoon swinging their cares away. These miniature wire planters are attached to a metal stake. They will stand tall in your fairy garden. Colorful and fun, and filled with green mossy goodness. Add these to your garden for a lovely, musical sound.